Back in the early 80s, I took an aerobics class at a local storefront fitness center. It was women only, so we weren’t trying to impress any Hans and Franz dudes. But it didn’t stop us from being adorable. This is me in 1983 in my favorite aerobics outfit. 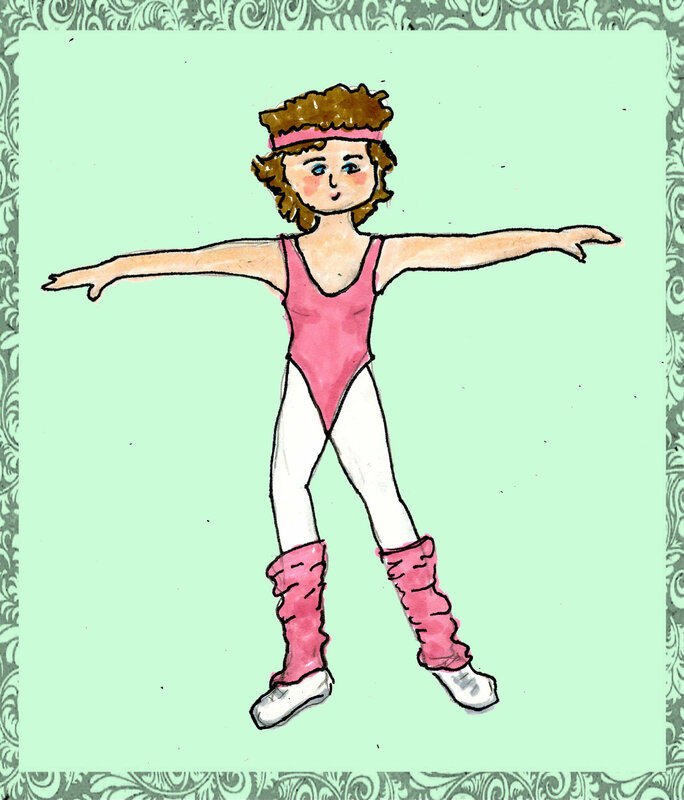 Yeah, you’re looking at a high-cut pink leotard with matching leg-warmers and headband. With white tights. Apparently, I was traumatized by not being allowed to take ballet as a kid. So I got another chance at 32. About two dozen ridiculously dressed women met twice a week and pranced around to Olivia Newton-John and Duran Duran. Then we’d take off our sneakers and weigh ourselves. We were all young and skinny then so it was just a tradition. Although I looked stupid, I had fun. 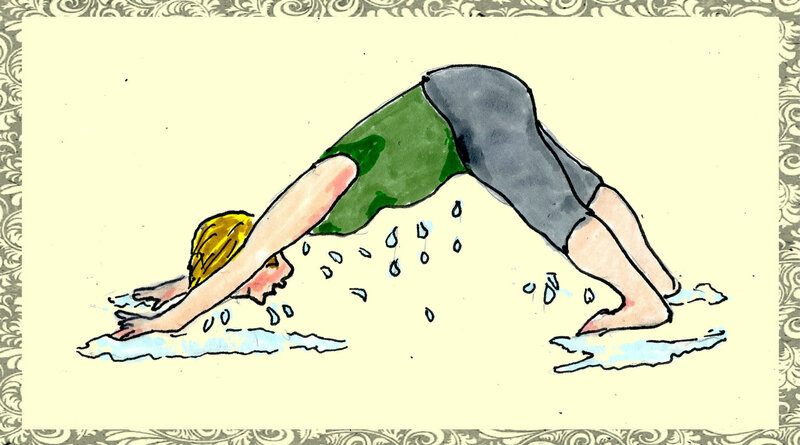 The crazy thing about exercising back then: I never sweated. I was the driest person on the planet. Even our post-class sauna couldn’t make me sweat. My friends and co-leg-warmer-wearers were amazed. Actually, they were a little creeped out. And here it is twenty-nine years later. All that sweat that I saved up in my thirties is delighted to break free in my sixties. You’d think my hormones would be done by now. But menopause is one of Nature’s greatest wonders. Like Niagara Falls. Hot flashes are uncomfortable. What happens when I exercise is astounding. Even mild exercise turns me into Rocky Balboa after seven rounds. I can weed the garden and water it at the same time. And strenuous exercise, like my Yoga (and YES, Yoga is strenuous) and Zumba? You know those boys who run out on the basketball court to wipe the floor after a player falls down? I could use a couple to stand on either side of me during Zumba. But sweating has its upside. I didn’t tell her that I look pretty much the same when I dust. The only extra power I am experiencing is in my sweat glands. Everything else…not so much. So many points of reference here. I too loved leg warmers. Your blog is becoming my safe place as far as admitting these things goes.For me, it was the Debbie Allan areobics work out album that I did in my living room. I can still hear her saying, Is that the best you can do?” in the background of Lou Rawls. Eventually I went through the record twice in a row each time, and the second time around her quip was a little bit more hurtful. I laughed out loud at your remark about the dusting. Add hives, and you have a perfect picture of me dusting. Lou Rawls aerobics sounds wonderful! Another hilarious, true to life, story. I don’t think I’ve ever passed the Niagra Falls stage because dusting still triggers a bright red face and plastered hair. Tried Zumba once – Ha! And never mind cute outfits anymore either. A slow walk is the ticket (if the weather is perfect). Tried Belly Dancing once but my husband laughed at the drips and wiggles. Thanks for the memories! P.S. I have ended my first blog and started another. Would love it if you follow me at Virginia Views http://countryliving4beginners.wordpress.com . Thanks. I had the identical outfit…although, my leg warmers were pink and white stripes. I actually have photos of me in it. Perhaps I shouldn’t admit that. Striped warmers were really sweet! You looked cuter than Olivia Newton-John…you don’t really give yourself due credit for having the efficiency to weed and water your garden simultaneously. No joke – I sleep with a fan directly on me, the a/c down at 66 degrees, and just a sheet…sometimes a sheet. My mom used to say that women don’t sweat, we ‘glow’. I have to tell you – I sweat. Ooh, me, too! Only my leotard was blue. With white tights, of course. Young, cute, skinny… and oblivious. I think we should be born with lumpy, tired, achy bodies and then gradually get firmer and fitter until we’re at a time in life when we can really appreciate it. That would not only be wonderful…it would be FAIR! You should think of this as wonderful. You are releasing and preparing (my heart mother told me this). Releasing built up poison, anything that gathered and shouldn’t be there it is all just whooshing out. Thus you are preparing for the next stage which is much less messy. As always I adore your drawings, they are so cute and to life. I don’t have to admit to these things. I actually did do ballet and even during the aerobics craze still did an adult ballet class. I confess…I tried ballet as an adult. The results were unfortunate. I can weed the garden and water it at the same time. My favorite line in this post. Thanks for the chuckles, again! “I can weed the garden and water it at the same time.” Ha ha! And I love that you impressed your yoga teacher. I have never been through an Olivia Newton John phase, but the second drawing is definitely me!! Love it! This, like Part One, is hilarious. Seriously, you need to combine these and turn it into an article or something so that even more people can enjoy it. I still have those leg warmers. Just sayin’. I’m thinking I could use them again – as icepacks! Would you mind moving to Texas? We’re suffering a bit of a drought here. I could take care of that for you. Based on your picture, I don’t doubt it! I remember those old workouts. I actually gained a few inches doing them. That may be because I hung out at that roller machine that you leaned against that was supposed to burn belly fat. It didn’t work. As for housework, I do consider that a real workout. And yes, I sweat then too. You always write such great last lines. How do you do it? I’m the worst about ending a blog post. I am 36 years old and already have night sweats sometimes — it still disturbs me that a person can sweat that much by simply lying in a bed. Hey, that’s a picture of ME in my 1980s aerobics class. Except I had a blue and white striped lycra leotard with BLACK tights and WHITE slouchy socks and headband. And I actually walked out of the Y, into the public eye, dressed like that! Good look, good times. Your outfit is totally Jane Fonda..
Maybe you and I are twins who were separated at birth (the only slight problem with this theory is that we’re not quite the same age, but that’s beside the point). I am the only person I know who travels to Edmonton, Alberta in February and packs shorts and tank tops in her luggage! I knew I would be wearing those outfits at least some of the time I’m there–even playing Mario Kart on Wii causes me to just about pass out–my sister-in-law had to place a fan right in front of me in order for me to keep playing. It’s not funny at all–when I’m trying to do even a little bit of housework I have to strip down to shorts, a tank top, bare feet and no bra! Not a pretty sight, for sure, but beats passing out in the middle of the living room floor! When will this end, I wonder? I wear my hair really short as it’s soaked a lot of the time and is just easier to restyle…and I rarely wear socks or even shoes–need bare feet and sandals even during cold Canadian winters…and don’t get me started talking about humidity and my reaction to it–living on the east coast, near the water, means that our summers are very humid and it’s a nightmare! If you find anything magical to help you with this, would you please share with me? Nothing has worked thus far and unless a person goes through the same thing it is difficult to understand. Nancy, I am always impressed by folks who multi-task so well. But never have I known one who could weed the garden and water it at the same time. I wore leg warmers over colored tights, paired with mini dresses, to the bars in the 80s. Men seemed to dig ’em! Sylvia, the natural remedy, Remifemin, works wonders when I take it. I used to take it by the handful but my doctor said two pills twice a day was good. Or, you could follow the directions on the box. All I know is, when I take it, I rarely have night sweats or day sweats, and I rant and rave a lot less at my husband and son. Wow. My own testimonial has me wondering why I’m not taking it now. If only I could remember where I put it. BTW, it doesn’t help with memory loss. Wine does, though. When you forget something, blame it on the wine. Good testimonial – except for the memory part! I’ll try it.